For more than five years now I have been a huge fan of Melvin Durai and his internationally syndicated columns. When I heard about his first book Bala takes the Plunge, I just knew I had to read it. This delightful hilarious novel chronicles Bala’s search for the perfect bride at a time when he has made a success of his career and settled comfortably into his life in the US. He has become a ‘Director’ as his company, though not the kind of director he envisioned himself to be. B. Balasubramaniam, B.E., had always wanted to be a director, but not quite the director he had become. He had wanted to direct Tamil movies and work with superstars like Rajnikanth and Kamal Hassan. His dreams of directing Rajni blow up in smoke when he takes up engineering. Bala’s parents didn’t agree on many things, so he took it seriously when they both raised objections to his ambition. Several chapters read like a continuation of his humorous essays. I had to take frequent breaks in between to wipe the tears streaming down my cheeks. It was a bone-chilling January day in Harrisburg, Pennsylvania, so cold that while shovelling snow that morning, Bala’s fingers turned numb, his moustache felt stiff and a single question kept popping into his head: was there any way to speed up global warming? Finally after trying all possible ways to gain companionship including keeping a dog and meeting eligible women in America itself, Bala returns to India where his parents shunt him from one meeting to another with girls of all hues. Most jokes required me to recover from my laughter and then resume reading. At times I abandoned the book altogether, spent a whole day reliving the joke and laughing at it in my mind telling it to everyone I knew so that by evening I could read the book with a straight face. I heartily recommend it for all who like a light read to brighten up their lives. Disclaimer: I received my copy of the book from the author himself, though unfortunately it was not signed by him which is what I wanted. 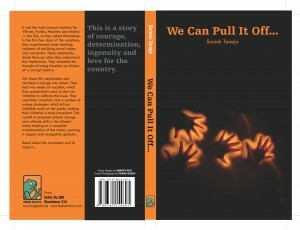 Indian residents can get the book from Flipkart at a fairly reasonable rate.